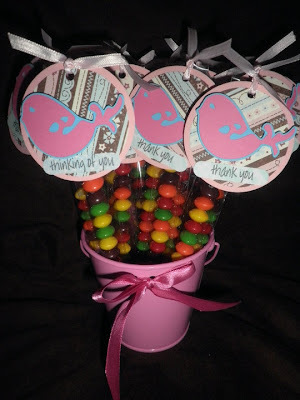 Paper Crafts by Candace: More Skittle Sticks! Here are some more skittle sticks for my craft fair on Sunday. The paper is from CTMH. LOVE the designer paper! My favorite color combo! I made 20 of these, 10 say Thank You and 10 say Thinking of You. I got the bags online at clearbags.com. They are 1x8 inches. The bird is from Gypsy wanderings. The circles are punches. Very quick and easy to put these together. These would make great co-worker gifts or for a friend. These could easily be customized to any theme as well. I didn't know what a Skittle Stick was until I saw the picture! They look great! Something like that would be fantastic to attach to a child's gift as well. Best of luck at the fair!! These are adorable! I love all your craft fair ideas. I do not ever do craft fairs, but I love the ideas you have and I have used many of them for gifts, thank you's etc. Thanks for sharing your great creativity!